Electric Island Festival takes over the Guam International Raceway in Yigo for Guam’s first and only electronic dance music festival. The 7th annual Electric Island Festival will hit the raceway June 22, 2019. Courtesy of EIF. Tumon (GU) — The guys behind the Electric Island Festival, Guam’s first-ever Electronic Dance Music Festival, are back for their 7th year in a row to promote music and social awareness. Jia Wang, CEO and Marketing Director for EIF, says this season is going to be an amazing run, bringing good music and good vibes throughout 2019. Since conception to its 7th year anniversary, the journey included uniting people through EDM, overcoming obstacles and never giving up. Wang and Festival Director Art DeGuzman wanted to bring something new to Guam — start a festival revolution. 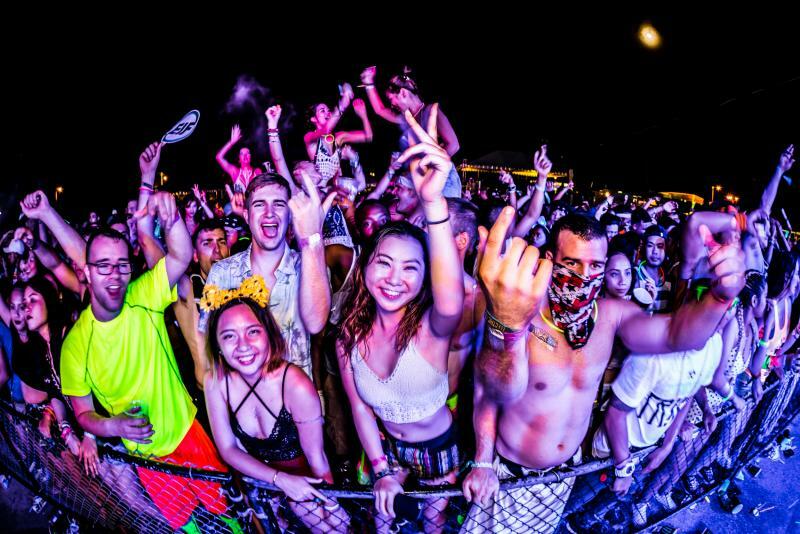 The concept of bringing an EDM festival to Guam sprang from something abstract, yet so impactful. “I was amazed at the fact that something intangible such as music and good vibes can attract tens of thousands of people to gather at a music festival to have genuine fun with their friends,” Wang says. Despite how excited they were to bring that same thing to Guam, the island influencers weren’t ready when Wang first approached them. That was back in 2010 after he met up with 300 Guamanians in Los Angeles to attend the Electric Daisy Carnival, one of the most popular EDM festivals around the world. “I knew then the timing was right to finally execute on this idea which I had, it's always been my intention to bring the music and vibe back home,” Wang says. However his plans to launch EIF in 2010 were shot down, but he wouldn’t take no for an answer. Wang flew home to Guam the following year to check out the scene for himself. He performed as a DJ at a few events, and met fellow DJ Ronnie Perez of Hit Radio 100. The idea of a concert-level music festival was gutsy, but Perez says he had high hopes for its success. In order to launch however, Wang scaled back his initial vision and the very first Electric Island Festival was born in 2013. “We faced painful learning experiences about market demand and chasing too many things at once,” Wang says. “There are not too many surprises these days, which is good so we can focus more on the creative experience and leveling that up for the coming year,” he adds. As he looks back at how hard it was to get his concept off the ground, he appreciates what came from the struggles. Nine years after the vision, the festival is in its 7th round as one of Guam’s largest music events, and Guam’s only EDM festival. Perez who was with them from the start, has been a resident DJ each year and seen its exponential growth. “The location grew from the Beach Bar to the Yigo Raceway. The fanbase has certainly exploded with the help of mainstream music,” Perez says. It’s also grown into a tourist attraction, bringing in people from all over the region, he adds. The group experienced a few stumbles as they took their initial steps, but took each roadblock was a learning experience. EIF has moved beyond a celebration of music. There was a sense of goodwill and unity from conception, but now with the popularity and the support, the team also hosts beach cleanups and seminars for those that want to become DJs. They give back by promoting social responsibility. The team hopes their struggle to turn something seemingly impossible into not only a reality, but a thriving phenomenon will inspire others to keep going. Everyone else behind the scenes are also grinding away to make the event run smoothly. The party starts with Road to EIF 9 p.m. to 2 a.m. March 23 at Globe Ultra Lounge. Co-headliner: Ace Ramos, is one of the main resident DJs at Xylo at The Palace in Manila. DJ Samurai (Neil Pineda) another Guam DJ who’s not only good behind decks, but is also good people.